Today, some friends wanted to go to that “New place” accross the street. Well it happened to be “Argo Tea“. I went to Argo tea once, and the day….well evening, I went there, I was having such a craving for white tea…It was so odd, who would crave for White Tea??? If not a tea geek. Anyway, I was on my way for St. Marks, and I found this Argo Tea place near the FlatIron district. And they happen to have some white tea there. Anyway…all of this talking to get to the fact, today I thought about posting something about this white tea I found in the office the other day. Some “Jasmin Silver Needles”. Actually, I tried it for the first time, today. (As I write, I am having my second brew). I am truly not a fan of Jasmin anything, especially when it comes to Tea…But it was not too bad. Here how it looks like. Visually, Silver Needles are just beautiful, too bad the plastic ruines it. “White tea is made from buds and young leaves, which are steamed or fired to inactivate polyphenol oxidase, and then dried. Thus, due to minimal oxidation, white tea retains the high concentrations of catechins present in fresh tea leaves. Green tea is made from more mature tea leaves than white tea, and tea leaves may be withered prior to steaming or firing. Although they are also rich in catechins, green teas may have catechin profiles different from white teas, with slightly higher levels of oxidation products”. Well basically, White Tea is the least processed form of tea..I don’t know about you, but to me “least processed” also sounds good! Some people describe its taste “Silky”, “Sweet” or “”flowery”. 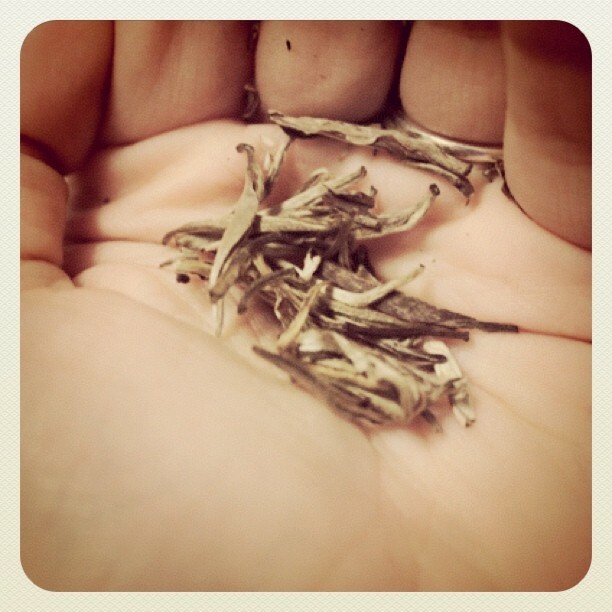 Not only you can learn more about White tea there, but you can also rate the white teas you tried. The cutest tea leaves ever. 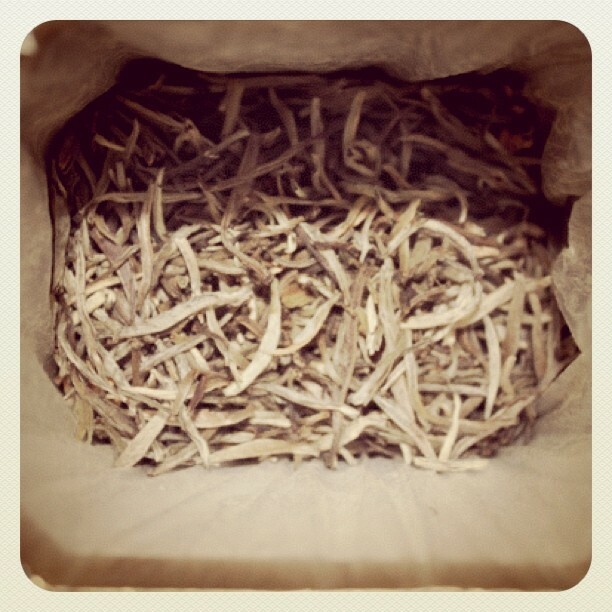 I have amazing Silver Needles “YIN ZHEN” at home, I got this tea in France, at Mariage Frères. Apparently there is a legend saying that a Chinese Emperor was so in Love with white tea, he made young ladies pick it up with golden scissors at dawn…when the first rays of light appeared on the horizon. I don’t know much about this legend, and who this emperor was, if you know, please comment.